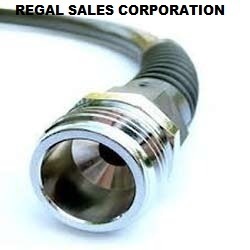 We Regal Sales Corporation are amongst the leading organization which manufacture, supply, distribute and trade premium array of Hose Connections. We offer very robust, flawlessly crafted and corrosion resistant hose connections that are chemical resistant and temperature resistant. These hose connections are used for efficient and strong connections between the hoses and the source. Our hose connections are designed into various sizes and diameters to suffice the variegated demands of our clients in the industry. We offer these hose connections at affordable prices.